Back in October 2017, Facebook acquired a social media app called ‘TBH‘ which was gaining popularity among teens in the United States. The app amassed around 5 million downloads and allowed teenagers, be it high school or college students, to compliment each other using anonymous polls. Facebook eventually shut down the app after spending $30 million for the acquisition, however, the social media giant learned some psychological tricks from tbh’s team to attract teenage users. An internal Facebook document obtained by BuzzFeed News has revealed that Facebook consulted tbh’s team on the latter’s aggressive method of marketing their app among teenagers, something which can help Facebook tackle its dwindling popularity among the teenaged user base. As per the memo, tbh leveraged Instagram’s popularity among teenagers and took the advantage of their tendency to mention their school’s name in the profile to market their product. To do so, tbh’s team targeted one school at a time and created an Instagram account with the school’s name, and then followed all accounts wherein the school’s name was mentioned. The tbh team would the pique the interest of its target audience by turning their Instagram profile’s status to private and waiting at least 24 hours to register follow-backs from the students by luring them with captions like “You’ve been invited to the new RHS app — stay tuned” and “At 4:00PM when school gets out (The Golden Launch Hour™), add the App Store URL to the profile“. 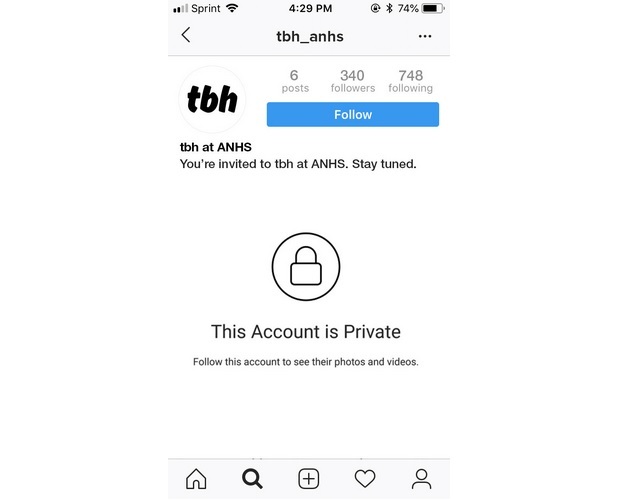 Once the countdown ended and the Instagram profile was made public, the students were notified that their request has been accepted and a download link for the tbh app was presented to them. While some of our methods are certainly too “scrappy” for a big company, there are analogous ways to employ these tactics at Facebook. For example, when using Facebook’s Quick Promos (or QPs), we should avoid providing an instant download link. Instead, we should request push notification permission to alert the targeted users at a later date. That way, we can collect their interest and contact them simultaneously to ensure critical mass during launch hour. Basically, it was a geographically-limited and time-consuming strategy, yet an effective way to pique the interest of teenage users and prompt them to download their app. Facebook certainly has the resources to implement a psychological move to drive growth among teenagers, something which the leaked document mentions in clear words, although the company would have to take a slightly different route than tbh to achieve its objective.